I will begin this by saying that we were the only guests in a five-suite bed and breakfast, otherwise I don’t believe the incident would have gone down as it did. During the initial tour earlier that day, our hostess (Mary Lee, the owner) opened up the refrigerator and showed me the top shelf, with all the cans of soda. She told us to help ourselves to the soda. We were also informed that we could use the refrigerator to store whatever we needed. “Plenty of room,” she said. I liked the ambiance of the B&B. When I booked the room, the phone call was much more pleasant than booking a hotel room. Very homey. For example, check in is from 3pm to 6pm, but the owner asked us if we could definitely make it between 4 and 6pm. The specific time line was requested because Mary Lee was taking her Amish neighbor to the doctor (earlier) and had a local community ice cream social (later). Upon our arrival, after our tour, she left us with her phone number and said if we needed anything we could call, and that she would be home around 9:30. She was precisely fifteen minutes late. I won’t forget. About 9:40 pm after watching the fastest sunset I have ever seen, Janelle and I headed into the house. I headed for a soda from the fridge, and asked if she would like one. “I’d rather have some of the iced tea,” she said. “Um…the lady didn’t say we could have any of the tea, she only mentioned the soda.” I am sometimes embarrassed to step beyond the boundaries, especially if the boundaries were set by a sweet lady who runs a bed and breakfast, and sets cookies on the counter for me all day long. I suggested that we make some hot tea, which was provided for us at the coffee station, and put ice in it, as that was also offered to us. “Well, I think I’m just gonna grab some from the refrigerator,” I was informed. I sat my laptop on the table and prepared to do a little bit of writing, when I heard her cry for help. “What?” I said, because that’s what I almost always say (even when I understand the questions perfectly. This may be something to explore in a later essay. It may be a habit to simply holler “What?” to every question asked of me, but there are times when I suspect that I am buying time to come up with an answer). “Just help!” she requested more forcefully this time. I looked up to see Janelle running to the sink, holding the glass jug of iced tea, a small drinking glass underneath it, with tea pouring non-stop out of the pouring mechanism, overflowing in the cup, leaving a trail of tea all the way to the sink. Years ago, I would have thought that such a scene would be out the the ordinary. That was before I met Janelle, though. She has a tendency to be the anomaly in the most normal situation than can be imagined. In Douglas Adam’s Book “The Long Dark Tea Time of the Soul”, Adams tells us about the fictional character Dirk Gently. A scene described in the book has Gently buying a couch for his upstairs apartment. The moving company gets the couch stuck in the hallway/stairs, and after a long time of attempting to get it un-stuck, they give up and leave it where it is. Gently calls in a team of physicists and mathematicians to help him figure out how to get the couch into his apartment, and after a time of calculations, they determine that it is physically impossible to get the couch into the position that it is currently in, unless the apartment building was constructed around the couch. Since I met Janelle, Adams fiction has literally become an everyday reality for me. If there is something to get stuck on, she will get stuck on it, and in an almost impossible way. If there is nothing to get stuck on, she will still get stuck on it. This soars high above an average level of clumsiness, into Heisenburgesque uncertainties. A few months ago she walked past a baby stroller while holding a Bungee cord from our car trunk, and caught the stroller. In a fraction of a fraction of a second, the strap was caught inside the stroller in such a manner that I had to disassemble the baby stroller in order to remove the Bungee. “What time is it,” I said again, this time aloud. “Quarter to ten,” Janelle answered. “What time is she supposed to be back?” I whispered. “Wonderful.” I used some rather fast Zen, shoved the rubber piece inside the plastic piece as hard as I could, and I felt the positive contact as it snapped into place. Handing the jar to Janelle, I began cleaning the sink. Not ten seconds after the jar was back in the refrigerator and the washcloth was folded and back where I got it from, the front door opened and the owner walked in. Every parent is able to sense that their children have been misbehaving. The posture the kids take when they are trying to look innocent; the gears spinning in their little heads trying to figure out if the parent knows that “something is up”; casually glancing around the room looking for any signs that might be a testament of their mischief. I haven’t felt like an eight-year-old since my time in college. But we looked guilty as hell. I was trying to look innocent. And the gears were spinning in my head. And I glanced around the room, looking for the evidence. I don’t really know if we weren’t supposed to drink the tea. Nothing was said. We had another nice little chat with our hostess, and then she went off to bed. 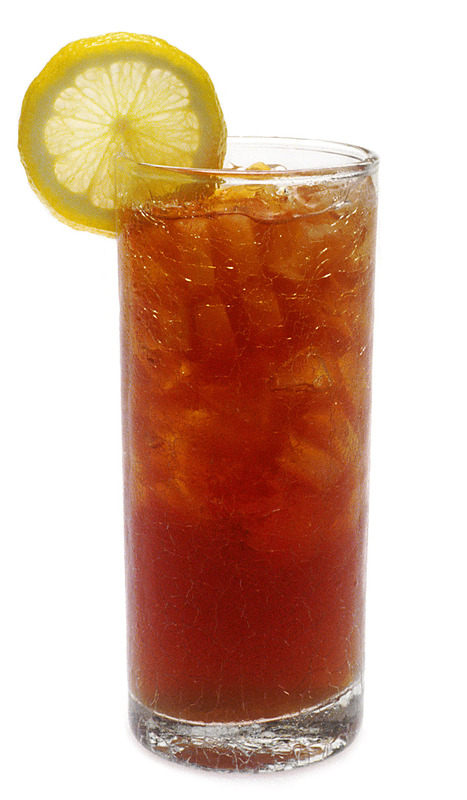 And the whole time, there was my lovely fiancée, standing there with a glass of iced tea in her hand. We went downstairs into the sitting room to hang out for a little bit, laughing at all that had just occurred. I asked Janelle if I could have a sip of tea in payment for all my assistance and hard labor.